Your home’s roof is the first line of defense against the harsh beating of the elements. Unfortunately, though, most of us forget that when it comes time to cross things off our preventative maintenance checklist. Whether it’s from strong winds, ferocious ice storms or simply old age, roofing materials can break at any moment. But how do you know when you have a leak? And what can you do to prevent one? 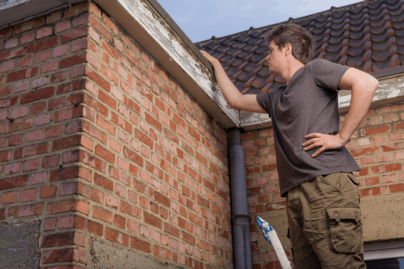 With these tips from Home Improvement Leads, inspecting your home’s roof will be a breeze. Yearly visual inspections are one of the best and easiest ways to ensure that your roof stays in peak condition regardless of the season. While atop your home, check that all shingles are in good shape with no signs of warping, blistering or breakage, and that rust or cracks are not present on the flashing and vent pipes. Moss or lichen growth are telltale signs that moisture is infiltrating your roof and causing boards to decay. So if you see vegetation of this kind sprouting on your roof, proceed with caution, as the boards may have weakened. Be sure to inspect your gutters for any buildup of asphalt grit, too, since large piles of this sand-like substance can be an indicator that your roof may need replacing. Although using a ladder to get up onto your roof will give you a more thorough examination, simply using a pair of binoculars will give you all the information you need, too. So find which method works for you and get investigating! Sometimes you can find signs of a leak before you even detect an issue on the roof. If you find brown patches on your ceiling or staining on your roof decking, if there is flaking, peeling paint near the roof’s edge or if the mortar of your fireplace is damp, it’s likely that moisture has seeped into your home through a crack in your flashing or a mislaid shingle. It’s important to discover the source of the problem as soon as possible in order to prevent extensive damage to the structural integrity of your home as well as thwarting dangerous mold growth. When you have signs of water damage, the problem spot is rarely directly above the stain, unfortunately. Water may seep in and run along a rafter for several feet before finally dropping off. 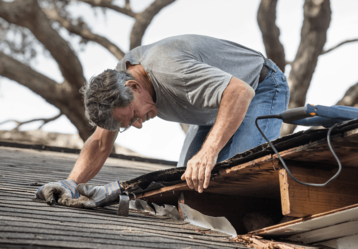 The best way to find the origin of the leak is by heading up to your attic to investigate during a storm or having a friend soak the roof of the house with a garden hose, starting closest to the gutters and slowly working up towards the peak of the roof. Position yourself in the attic directly over the stain, and scan your roof decking and rafters for signs of water trails and moisture. Two important tips to remember: affix a spray attachment to the hose so as to best mimic natural rainfall, and—since water reflects light—use a flashlight to make finding water trails easier. Whether you are finding the source of a problem or just doing your yearly inspection, a couple hours is all it takes to keep your roof in tip-top shape and safe from harmful leaks. Do you think it’s time for a new roof? We can help! This blog was guest written by Courtni Wisenbaker-Scheel, with Home Improvement Leads. Is it Okay to Do Roofing in the Winter? Bloomfield Construction is a family-owned business in Southeast Michigan. We specialize in roof repair, replacement and restoration and insurance repair claims.